The Peerless Model 700-6X Extended Chain Link Handcuffs come with six extra links compared to standard cuffs, giving them an additional 5.5-inches of length. This makes the cuffs more suitable for subjects with larger upper bodies, reducing stress to the shoulders, arms and wrists during transit. Alternatively, the handcuffs can conveniently link two sets of restraints together for more secure transport of subjects in custody. 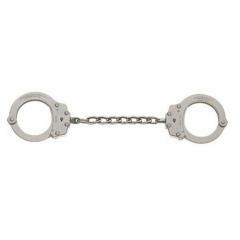 The design is based on the popular, National Institute of Justice-approved Model 700 handcuffs. Peerless improves their internal locking mechanism for enhanced security, smoothness and ease of use. Each handcuff includes two keys.